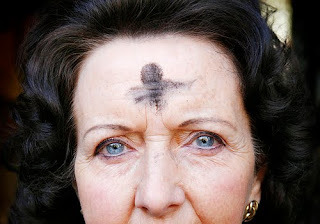 Today is Ash Wednesday, the first day of Lent, a day of reflection, repentance, and preparation. The Lent season mirrors the forty day separation of Jesus into the desert for temptation and it culminates in Holy Week and Easter Sunday when Jesus does his great unrepeatable work of redemption. When Jesus went into the desert, he carried with him a newly discovered identity, one which resonated with everything in him, the identity declared to him at his Baptism: "this is my son in whom I am well pleased." This identity, though unrelentingly true, was nothing easy to swallow. It had to be tested, it had to be tempted, it had to be practiced. So Jesus departed to the wilderness with all the weight of this identity on his shoulders in the footsteps of those before him. Just as the Hebrew people fled their old, dead, pseudo-identity; Jesus fled all the alternatives and wandered anew into the desert. He went not as a slave although he may have felt like one, and not as a hero on a white horse although the people may have wanted him to act as such, but as a Son of God beloved by his father and sent to find a new land, a promised land, a new creation. Jesus wandered and fasted and met his test. The adversary met him there; the one who embodied the old identity, who stunk with the stench of all the patterns of a cursed existence. Like a serpent in a garden, this adversary opened his hand to Jesus and offered Jesus that for which he was searching and yet that which he already had. Jesus knew that any bread that the Devil can offer is not the bread on which people must live which has already been given through the Word made Flesh. And any power offered by the Devil is not the kind of power already given through the Holy Spirit. And any nation whose knees might bend at the Devil's bidding is not the Kingdom of God, already dwelling among us. Jesus had heard his identity at his Baptism but his eye had not yet seen it, he had to live it in the wilderness where those who worshiped the Calf had failed. Systematically, Jesus embraced his identity and rewrote the story. He was who he was and now his end awaited him... not an end as in that which stops but an end which gives way to new beginnings and new creation. Jesus himself walked to cross and resurrection, to death and renewal. He retold an old story, defeated the cursed existence, and gave way to newness. And this Jesus, the beloved Son of God, calls us his brothers and sisters and he calls us to follow him. He shares this identity with us and offers his body to us. As we enter this story with Jesus on Ash Wednesday, as we take on a new identity and begin a new journey into the wilderness with Jesus, we remember every time and every way in which we did/do not live out our true identity. We remember how often we choose someone else's bread, someone else's power, someone else's allegiance, someone else's story. We remember and so we repent. We cover ourselves in ash and we fast, just as Moses fasted (Exodus 34:28), over our new identity. Our new identity, our belovedness and God's unfathomable love for us reveals to us the darkness of the curse and the foolishness of our iniquity. And so we repent and mourn and yet we look forward with new eyes. We walk forward with new feet. We walk with Jesus and we walk toward redemption, living out our belovedness in the desert. We prepare ourselves to go from here toward something new and something beautiful. For because of the resurrection, our sins are forgiven and our labor in the Lord is not in vain (1 Corinthians 15).